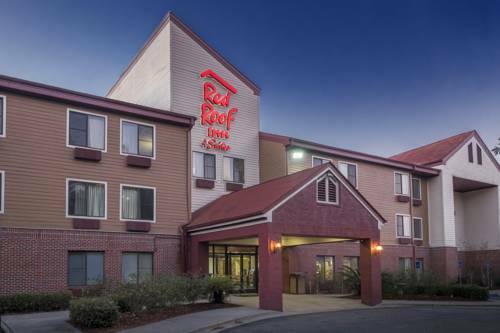 The Red Roof Inn and Suites Savannah Airport is a Southern gem! Located 2 miles from the Savannah Airport at I-95 exit 104, and adjacent to the New Tanger Outlet Mall and only 2 miles from the New Surf Lagoon Water Park. Stay close to historic downtown Savannah at this Pooler hotel, where southern hospitality is our specialty. With Newly Renovated guest rooms, you can rest easy knowing that you'll have plenty of space whether you're here for an extended stay or a weekend getaway. Our eco-friendly hotel is designed with your comfort in mind. Our sparkling pool is open until 10:00 PM. Fresh baked Otis Spunkmeyer cookies are offered every evening for your enjoyment as well as our 24 hour coffee bar. Start your morning with a deluxe continental breakfast featuring hard-boiled eggs, waffles, oatmeal, bagels and cereal. Walk to Ruby Tuesday, New Tanger Outlet Mall and Walmart from our hotel.